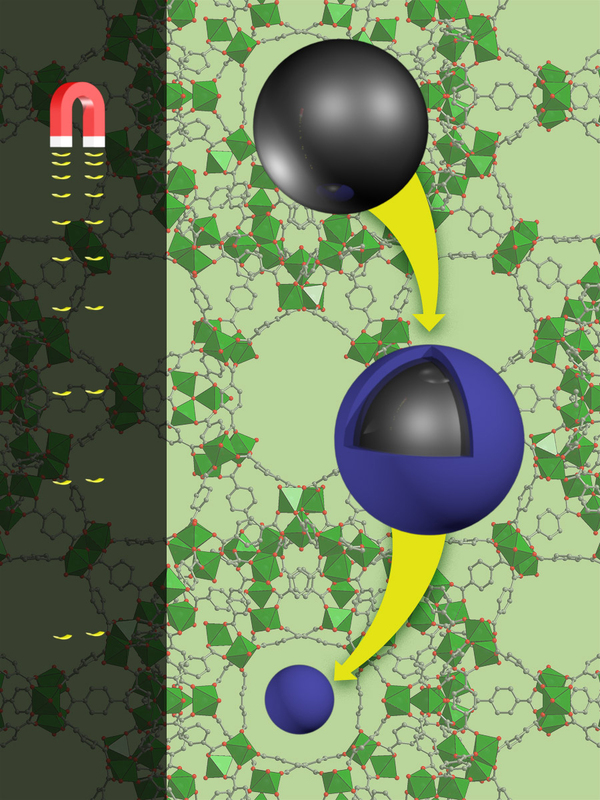 The magnetic strength (left) drops when magnetic iron microspheres (black) are wrapped up in a metal-organic framework shell (blue). Image courtesy of Nathan Johnson, Pacific Northwest National Laboratory Enlarge Image. Surface mining for rare earth elements used in smartphones and wind turbines is difficult and rarely done in the United States. Scientists wanted to know if they could pull the metals, present at trace levels, from geothermal brines using magnetic particles. The particles, wrapped in a molecular framework shell known as a metal-organic framework (MOF), should easily trap the metals and let the rest flow past. 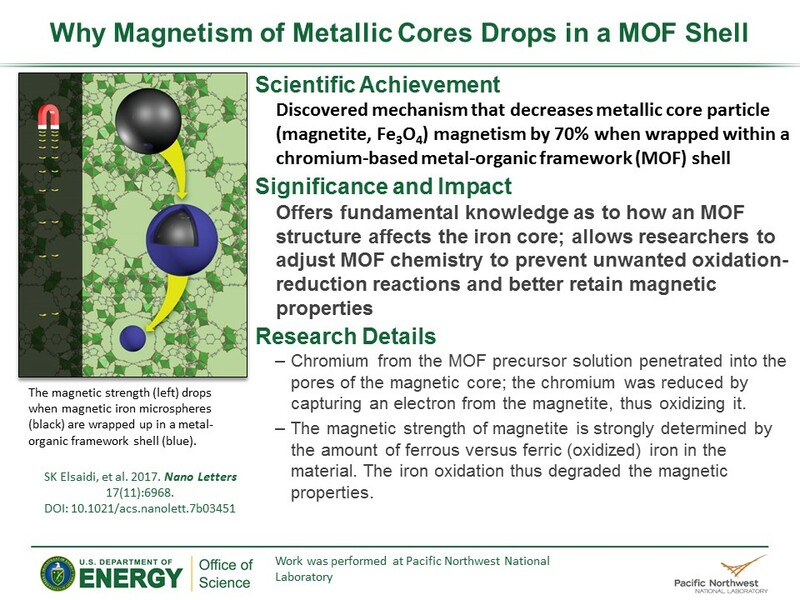 However, the team led by Dr. Pete McGrail at Pacific Northwest National Laboratory found the magnetic strength dropped by 70 percent after the MOF shell was formed. Why It Matters: The use of MOFs may allow for the separation of yttrium, scandium, and other elements from saline water from geothermal sources, produced waters from oil and gas fields, or wastes such as fly ash. "These elements have a lot of applications -- petroleum refining, computer monitors, magnets in wind turbines," said Dr. Praveen Thallapally, the materials design lead on the study. "Right now, 99 percent of these rare earths are imported to the U.S."
The fundamental knowledge gained from this research shows why this MOF affected the magnetic strength so much and offers insights into methods to avoid these problems. Summary: Scientists began with an MOF called Fe3O4@MIL-101-SO3. It contains chromium ions connected by organic ligands. The synthesis process forms the MOF shell by a molecular self-assembly process with the MOF building up a layer around the magnetite core particles. Researchers expected the shell to have little impact on the magnetic strength of the particles but found it dropped by 70 percent. "We wanted to figure out why," said Thallapally. Theories abounded, but nobody had brought together the materials, expertise, and instrumentation to definitively prove what was happening. They used imaging capabilities at DOE's Environmental Molecular Sciences Laboratory, an Office of Science user facility located at PNNL. Specifically, they used scanning electron and transmission electron microscopy to study the MOF shell. They found that the particles increased in size as expected. This meant the problem wasn't the magnetite particles dissolving in the liquids used during synthesis, a common theory. Next, they also used 57Fe-Mössbauer spectroscopy to study the oxidation state of the metal core. They found a larger amount of oxidized ferric iron than expected. Digging in further with atom probe tomography, the team found that chromium had crept inside the iron cores. They obtained more details on the chromium oxidation state using X-ray absorption fine structure spectroscopy at the Advanced Light Source, a DOE Office of Science user facility at Lawrence Berkeley National Laboratory. Cleared slide summarizing research conducted for the DOE Geothermal Technologies Office and the Office of Science. Download PowerPoint slide. In the end, the team showed that the chromium penetrated into the pores in the iron particles and was reduced by capturing an electron from the iron thus oxidizing it. The magnetic strength of magnetite is strongly determined by the amount of ferrous versus ferric (oxidized) iron in the material. The iron oxidation thus degraded the magnetic properties. These fundamental insights will allow materials science researchers to adjust the MOF chemistry to prevent the unwanted oxidation-reduction reactions and better retain the core-shell material's magnetic properties.